and tranquility to any yard. where stress dissolves and relaxation is the only rule. easy once you know how to bring the different design elements together. Japanese gardens are based mainly on symbolization, and every component of your garden should represent some facet of nature. It’s about creating a perfect miniature copy of the natural world around you. Choose organic items that you can find locally, and avoid using symmetry when designing the space. The overall look should be uncomplicated. Simplicity is key when making a Japanese garden. There should be balance within your garden, and you should view each piece as part of a whole. Balance curves with lines, use low and high elements, and incorporate wet, dry, hard and soft objects. If you have a small space, sticking with smaller elements is a good way to keep balance. Everything in your garden should harmonize perfectly. 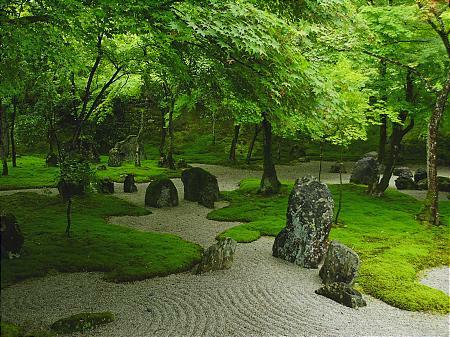 One of the essentials to designing a Japanese garden is creating the feeling of mystery and space. In general, different portions of your garden should be hidden, and you should never be able to view the entire garden from one location. Use existing foliage or other scenery to conceal various areas of your garden. As you design the entire area, keep a balance between empty space and the elements you use to fill it. The core of any Japanese garden is stone. Before you begin designing, select a variety of rocks to place throughout the area. Group your stones in odd numbers and unusual patterns so there is always a balance vertically and horizontally. You can partially bury some in the earth as stepping stones and use some as sculptures. Even something as simple as placing layered pavers around a flower bed will suffice. Your garden should also have sand, foliage and a water feature. Use stones to section off an area, and fill it with sand. Rake the sand into a pattern to represent a body of water. Throughout the garden, place an assortment of greenery such as the Japanese maple, juniper, pine, yew and Japanese barberry. Choose different textures and colors, and consider blossom patterns for flowers. To balance out land and sea, select one or two water elements such as a pond or fountain. Japanese gardens typically have some sort of bridge in them as well. Bridges and stairs represent the journey of life. Use a small bridge to connect two flower groupings, or place steps at the entrance of your garden. If you’re short on space, you can create pathways lit with decorative lanterns. When it comes to ornamentation, keep it simple. Use objects like lanterns, basins and spiritual artifact sparingly. The type of garden you choose should reflect your own philosophies and needs. The most common style is the Zen meditation garden. This space is crafted using mostly stone and sand. The most important guideline is the arrangement of your elements. Place a diverse collection of stones around the perimeter of the space, and fill the area with raked sand. Set one or two large rocks and several smaller ones in the center space, and limit the use of greenery. Another popular design is the strolling garden. These spaces are meant to be walked around, so plan your pathways and views beforehand. Each section should be as scenic and serene as the next. Paving stones make perfect borders, and you can even construct a pond at the end of the path. Plant shrubs, flowers and trees around the walkway so they look as if they are sprouting from the stones. If you want a more traditional design, consider creating a tea garden. These gardens usually have entrance gates, which creates an instant calmness as a person steps into the garden. Lay a path of stepping stones that winds through the garden to a central point. Place stone basins filled with water throughout the garden, and put a bench in the center for meditation purposes. 1. Is there room for a full garden landscape? 2. Will the garden be viewable from the house? 3. Do you prefer formal over rustic? 4. Can you add all the key elements, including water? 5. How will the garden be utilized? Japanese gardens stand apart from their traditional counterparts because of their structure. To truly make the garden yours, you can use the various elements according to your own symbolic interpretations. For more tips on how to create a peaceful Japanese garden, contact Install It Direct. A quiet, tranquil, spiritual retreat is waiting for you.